KUDOS UB-413HE Accepts all U type dies used for 12 ton compression tools. KUDOS UB-412HE C-frame has open jaw for easy access to the fitting. KUDOS UB-412HE Operated by any hydraulic pump with rated oil pressure of 700 bar (10,000 psi ). KUDOS UB-412HE Single action cylinder with spring return. KUDOS UB-412HE Dies are easy to change. 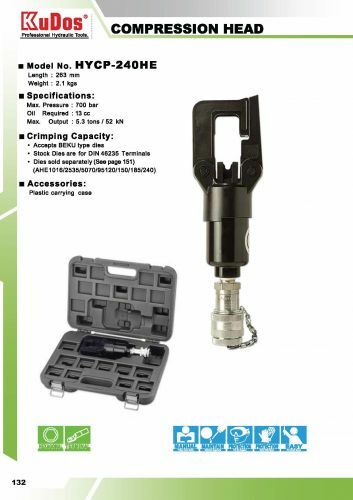 KUDOS UB-412HE Crimping capacity identical to UB-412 tool. KUDOS H-412HE C-frame has open jaw for easy access to the fitting. KUDOS H-412HE Operated by any hydraulic pump with rated oil pressure of 700 bar (10,000 psi). KUDOS H-412HE Single action cylinder with spring return. KUDOS H-412HE Handle grip for easy carrying. 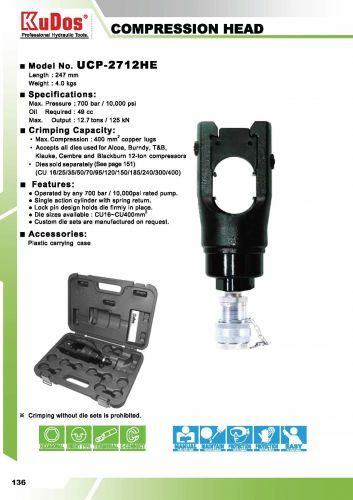 KUDOS H-412HE Crimping capacity identical to UB-412 tool. KUDOS H-412HE Dies are easy to change. 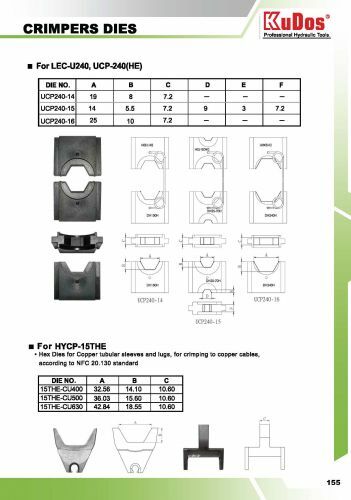 KUDOS HYCP-4013HE C-frame has open jaw for easy access to the fitting. KUDOS HYCP-4013HE Operated by are hydraulic pump with rated oil pressure of 700 bar (10,000 psi). KUDOS HYCP-4013HE Single action cylinder with spring return. 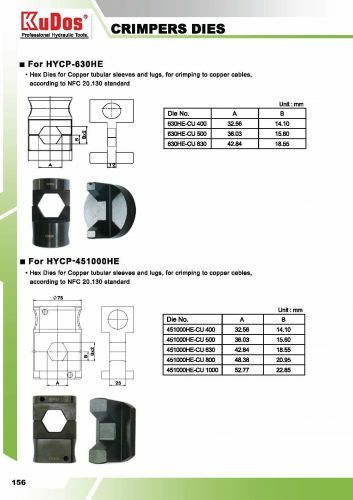 KUDOS HYCP-4013HE Die are easy to change. KUDOS UC-6HE Light weight, compact and slim design. KUDOS UC-6HE Operated by any hydraulic pump with rated oil pressure of 700 bar(10,000 psi). KUDOS UC-6HE Dieless compression to crimp Anderson style connectors up to 500 MCM. KUDOS UC-6FTHE Light weight, compact and slim design. KUDOS UC-6FTHE Operated by any hydraulic pump with rated oil pressure of 700 bar(10,000 psi). KUDOS UC-6FTHE Dieless compression to crimp Anderson style connectors up to 750 MCM. 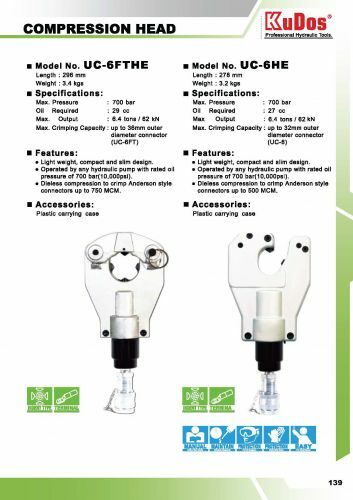 KUDOS HYCP-15THE C-frame has open jaw for easy access to the fitting. 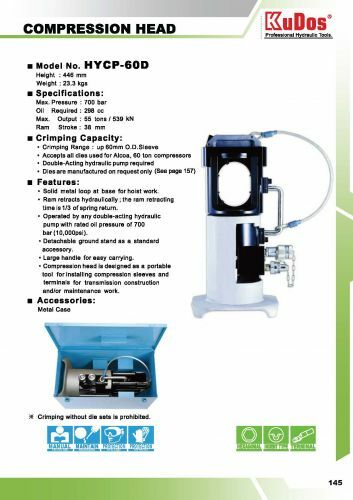 KUDOS HYCP-15THE Operated by any hydraulic pump with rated oil pressure of 700 bar (10,000 psi). KUDOS HYCP-15THE Single action cylinder with spring return. 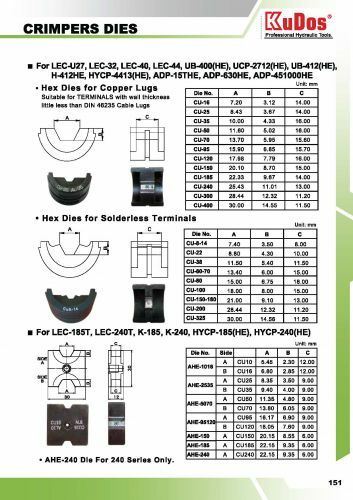 KUDOS HYCP-15THE Dies are easy to change. KUDOS UCP-240HE Light weight, compact and slim design. KUDOS UCP-240HE Operated by are hydraulic pump with rated oil pressure of 700 bar (10,000 psi). 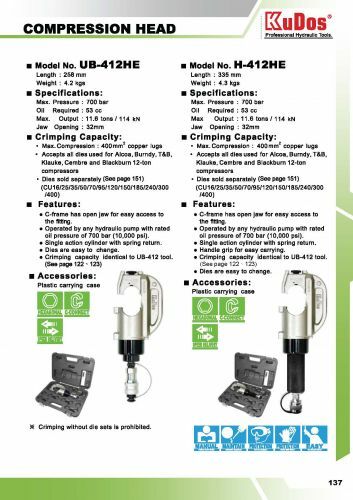 KUDOS HYCP-630HE 12 ton dies sold separately. 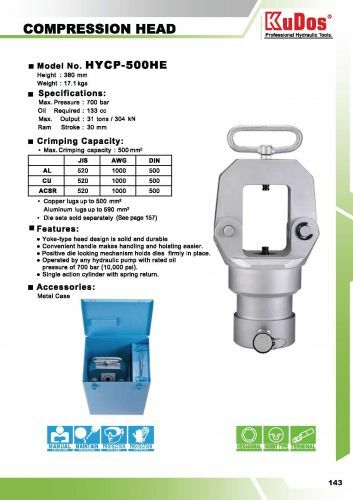 KUDOS HYCP-630HE Simple U-type head design is solid and durable. KUDOS HYCP-630HE Lock pin design holds die firmly in place. KUDOS HYCP-630HE Operated by any hydraulic pump with rated oil pressure of 700 bar (10,000 psi). KUDOS HYCP-630HE Single action cylinder with spring return. Lock pin design holds die firmly in place. KUDOS HYCP-451000HE Operated by any hydraulic pump with rated oil pressure of 700 bar (10,000 psi). KUDOS HYCP-451000HE Single action cylinder with spring return. 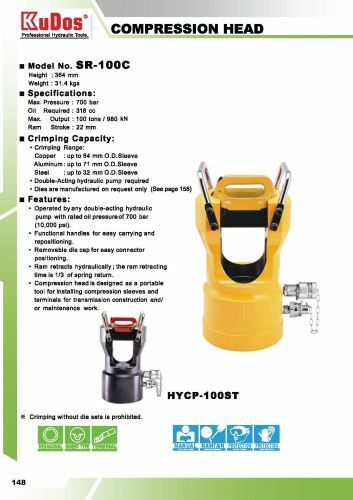 KUDOS HYCP-500HE Convenient handle makes handling and hoisting easier. KUDOS HYCP-500HE Positive die locking mechanism holds dies firmly in place. 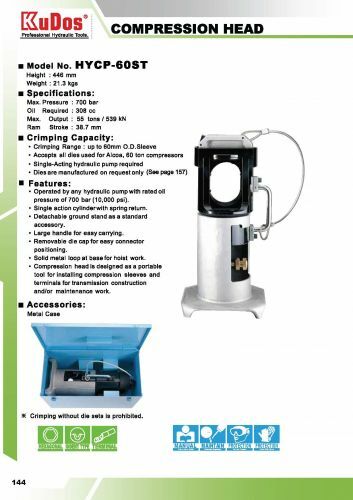 KUDOS HYCP-500HE Operated by any hydraulic pump with rated oil pressure of 700 bar (10,000 psi). 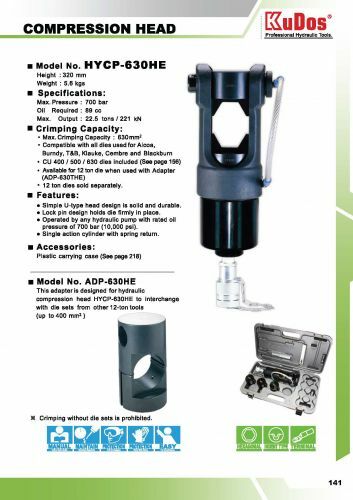 KUDOS HYCP-500HE Single action cylinder with spring return. 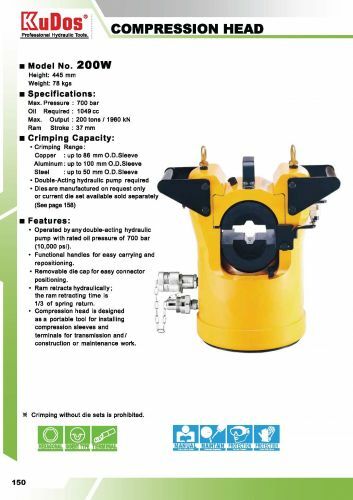 KUDOS HYCP-60ST Operated by any hydraulic pump with rated oil pressure of 700 bar (10,000 psi). 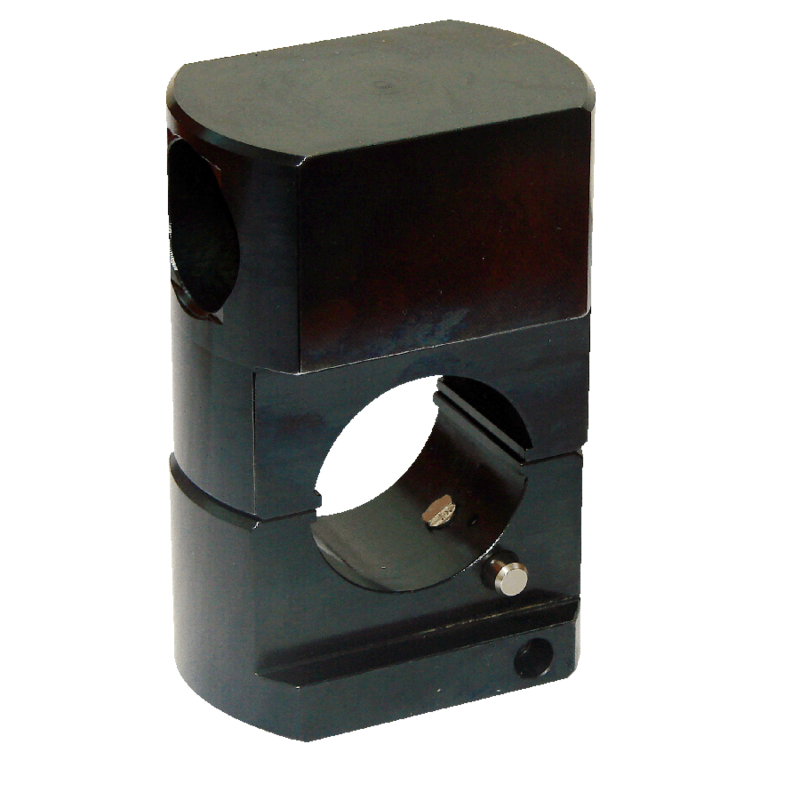 KUDOS HYCP-60ST Single action cylinder with spring return. KUDOS HYCP-60ST Detachable ground stand as a standard accessory. 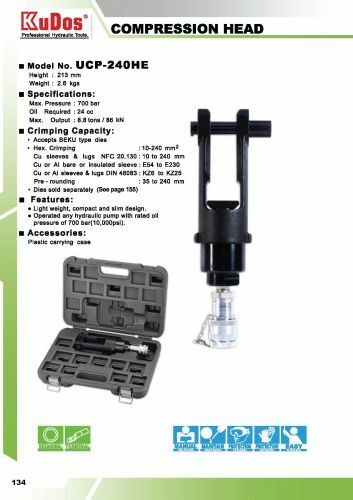 KUDOS HYCP-60ST Large handle for easy carrying. 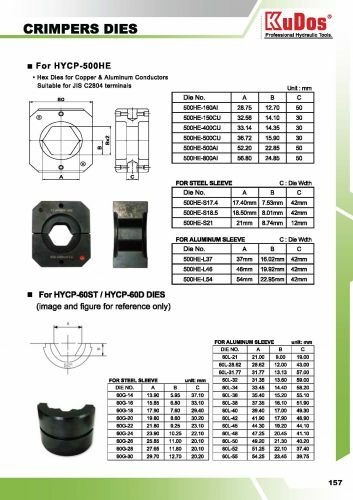 KUDOS HYCP-60ST Removable die cap for easy connector positioning. KUDOS HYCP-60ST Solid metal loop at base for hoist work. 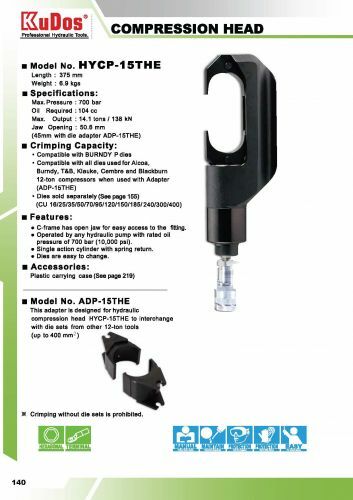 KUDOS HYCP-60ST Compression head is designed as a portable tool for installing compression sleeves and terminals for transmission construction and/or maintenance work. 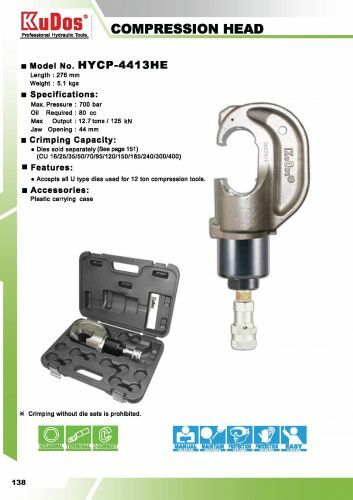 KUDOS HYCP-60D Solid metal loop at base for hoist work. KUDOS HYCP-60D Ram retracts hydraulically; the ram retracting time is 1/3 of spring return. KUDOS HYCP-60D Operated by any double-acting hydraulic pump with rated oil pressure of 700 bar (10,000 psi). KUDOS HYCP-60D Detachable ground stand as a standard accessory. 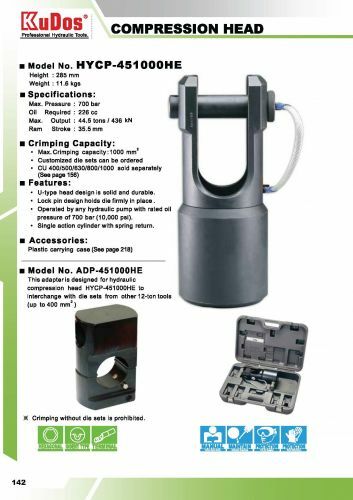 KUDOS HYCP-60D Large handle for easy carrying. 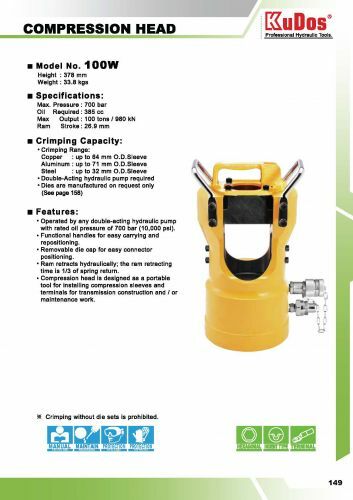 KUDOS HYCP-60D Compression head is designed as a portable tool for installing compression sleeves and terminals for transmission construction and/or maintenance work. KUDOS SR-100C Operated by any hydraulic pump with rated oil pressure of 700 bar (10,000 psi). KUDOS SR-100C Functional handles for easy carrying and repositioning. 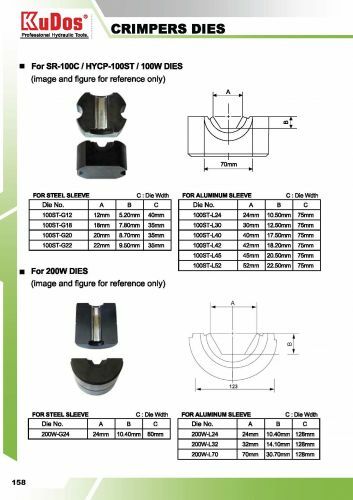 KUDOS SR-100C Removable die cap for easy connector positioning. KUDOS SR-100C Ram retracts hydraulically ; the ram retracting time is 1/3 of spring return. 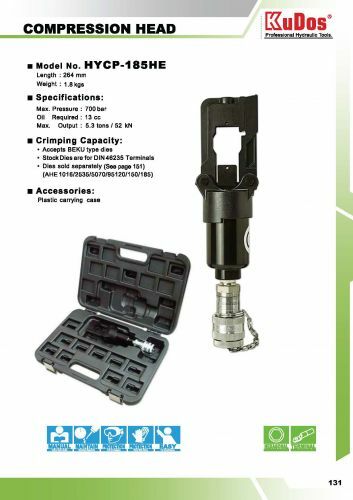 KUDOS SR-100C Compression head is designed as a portable tool for installing compression sleeves and terminals for transmission construction and/or maintenance work. KUDOS UCP-2712HE Operated by any 700 bar / 10,000 psi rated pump. KUDOS UCP-2712HE Single action cylinder with spring return. 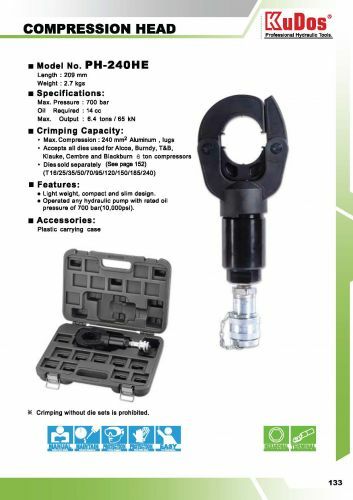 KUDOS UCP-2712HE Lock pin design holds die firmly in place. 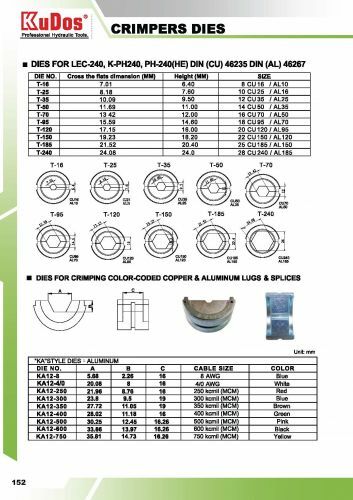 KUDOS UCP-2712HE Custom die sets are manufactured on request. KUDOS HYCP-4413HE Accepts all U type dies used for 12 ton compression tools. KUDOS PH-240HE Light weight, compact and slim design. KUDOS PH-240HE Operated by are hydraulic pump with rated oil pressure of 700 bar (10,000 psi). 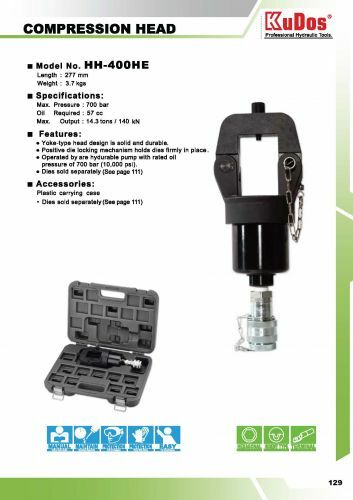 KUDOS HH-400HE Yoke-type head design is solid and durable. KUDOS HH-400HE Positive die locking mechanism holds dies firmly in place. KUDOS HH-400HE Operated by are hydraulic pump with rated oil pressure of 700 bar (10,000 psi). KUDOS 100W Operated by any hydraulic pump with rated oil pressure of 700 bar (10,000 psi). KUDOS 100W Functional handles for easy carrying and repositioning. KUDOS 100W Removable die cap for easy connector positioning. KUDOS 100W Ram retracts hydraulically ; the ram retracting time is 1/3 of spring return. KUDOS 100W Compression head is designed as a portable tool for installing compression sleeves and terminals for transmission construction and/or maintenance work. 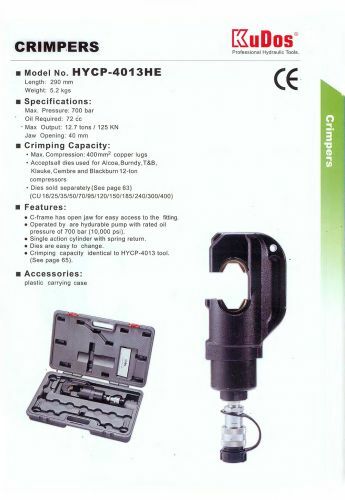 KUDOS USA HYDRAULIC CRIMPERS 200W.pdf. KUDOS 200W Operated by any hydraulic pump with rated oil pressure of 700 bar (10,000 psi). KUDOS 200W Functional handles for easy carrying and repositioning. KUDOS 200W Removable die cap for easy connector positioning. KUDOS 200W Ram retracts hydraulically ; the ram retracting time is 1/3 of spring return. KUDOS 200W Compression head is designed as a portable tool for installing compression sleeves and terminals for transmission construction and/or maintenance work.